About 3 weeks ago in Kings Cross I thought I saw a ghost, my eyes seemed to be playing tricks. 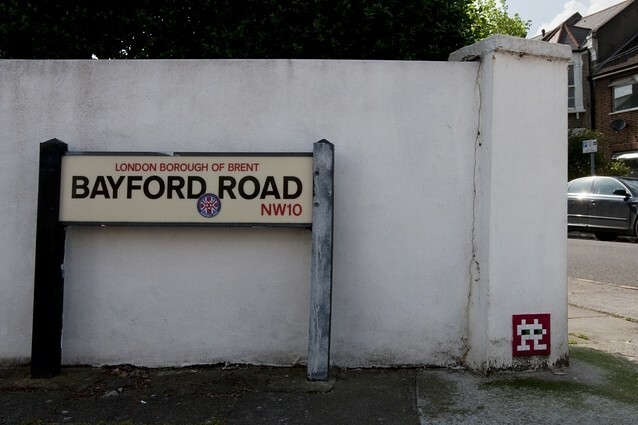 A old, long departed friend, a Union flag Space Invader which had disappeared a few years ago had magically reappeared. 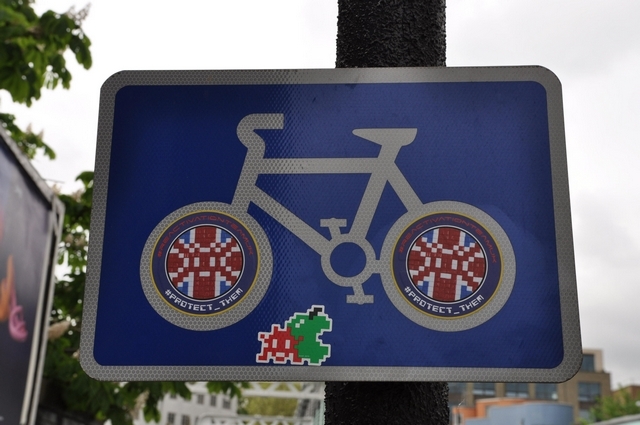 Subsequently I read a blog post by Art Of The State, great friend to this blog about the 12 new Space Invaders put up during the 18th invasion of London by Space Invader but this Union flag seemed to be counted outside the canon, the new dozen. 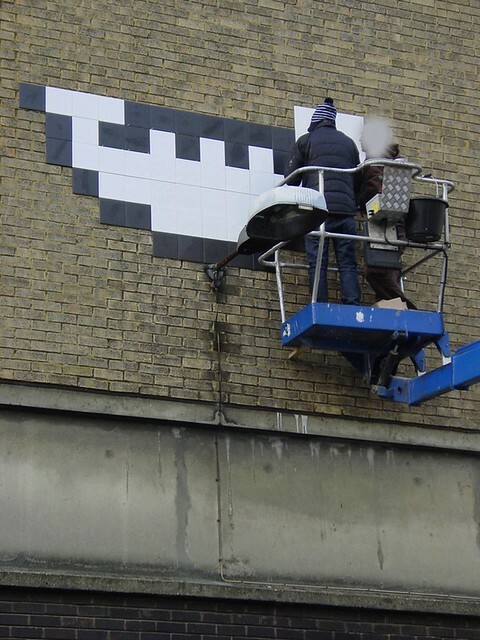 I assumed it was a cheeky little bit of restoration as a side project on Invader’s most recent visit. A week later, whilst standing and admiring another long lasting Invader presence which I had the good fortune to catch as it touched down about 7 years ago, which event I remarked upon in a little bluster of words about how much I enjoyed the constantly changing gallery of street art in Shoreditch, I spotted something new. 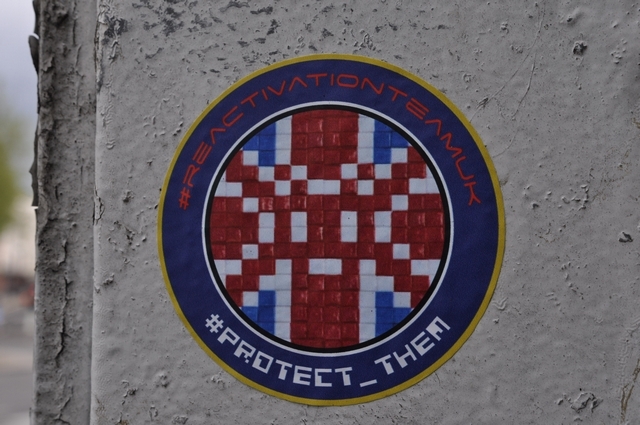 It was an Invader sticker and the caption around the edge was most intriguing, “Reactivation team UK” it said. 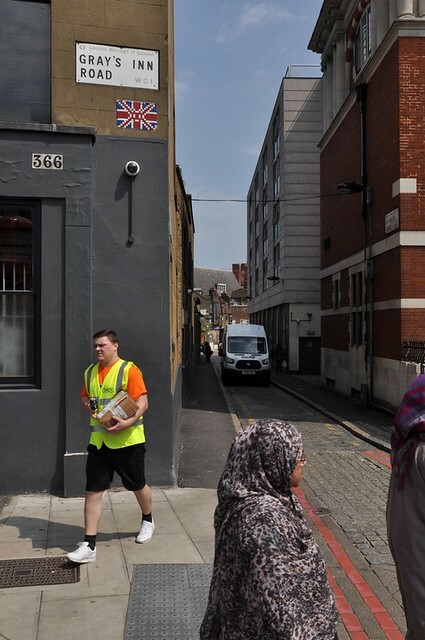 This made immediate sense in the context of the Union flag re-materialising back on the walls of Kings Cross. Based on my own admittedly unreliable memory this may well be the third Invader incarnation on that very spot. 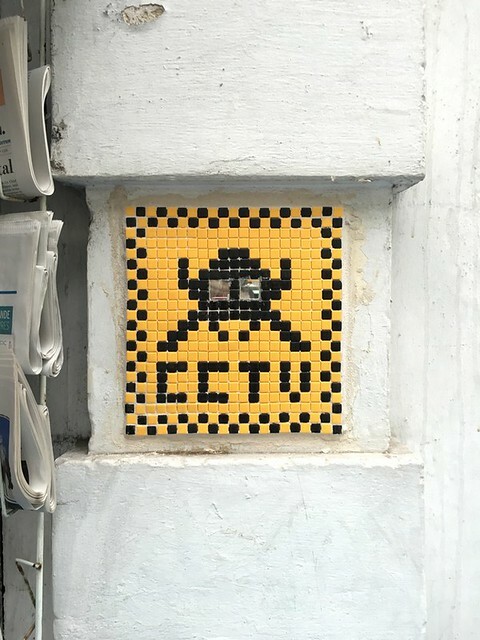 Further discussion with AOTS revealed that Invader reported earlier last week that LDN_01 had reappeared at its original location. 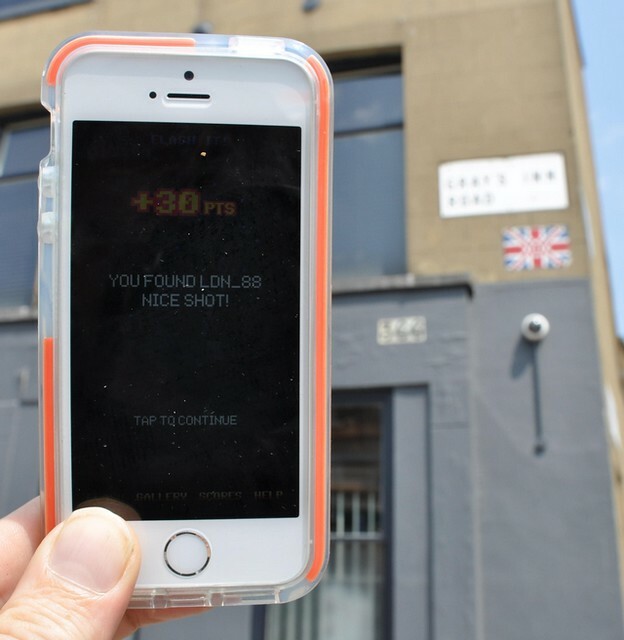 Annoyingly my photo of the original LDN_01 has hidden itself somewhere on my computer but here is confirmation that it has indeed made a re-appearance. 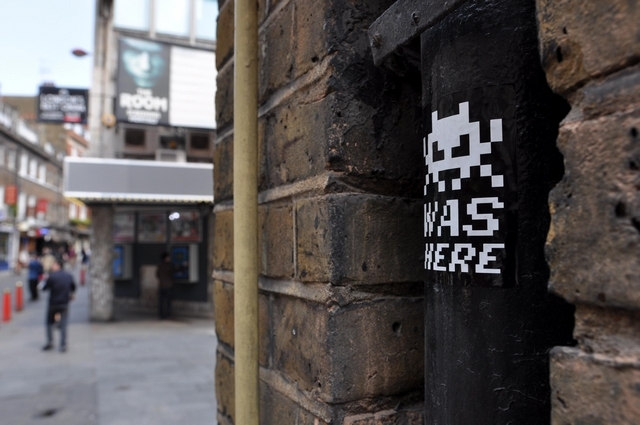 So, Invader is reinstating older Invaders which have been zapped into oblivion by the ravages of time, authority, heavy handed property owners or plain old sticky fingered fans. 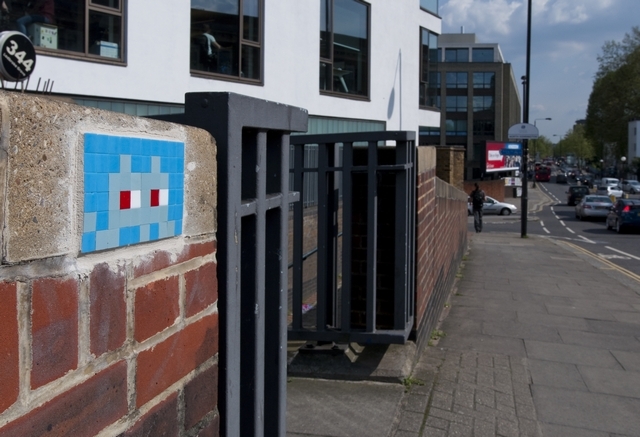 Then last week I had the pleasure of a chance encounter of the first kind with Scraffer Arts who unsurprisingly is a passionate Space Invader geek. He told me that apart from the one I had seen on the Ladbroke Grove Bridge there were three others in the vicinity so, what could I do but extend my bike ride even further to investigate those restored Invaders. I didn’t see any of these Invaders in their original manifestation but they do look stunning in their re-born forms. The concept of resurrected Invaders is not without its problematic aspects. 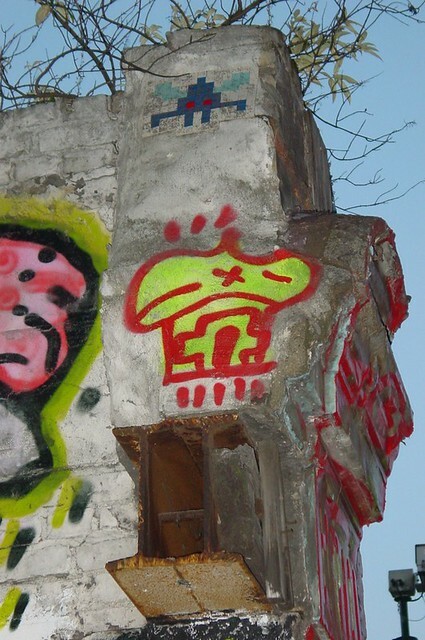 We are generally agin the preservation of street art. Only Banksy street art that gets that treatment (ok, so there is a plexiglass covered C215 on Brick Lane) and indeed Banksy is an exceptional case where his art on the streets is close to taking on "national treasure" status. Some artists get a bit angsty when their art is damaged or painted over but frankly if you are sensitive about that, if you aren't prepared to let your art go, then the streets is not really the right gallery for you. 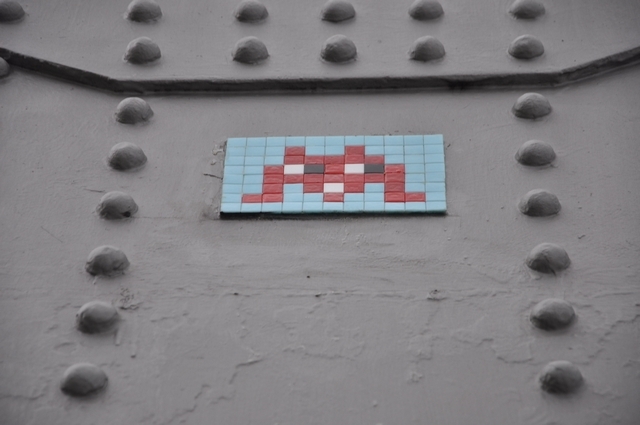 This Space Invader action though is in a different category. 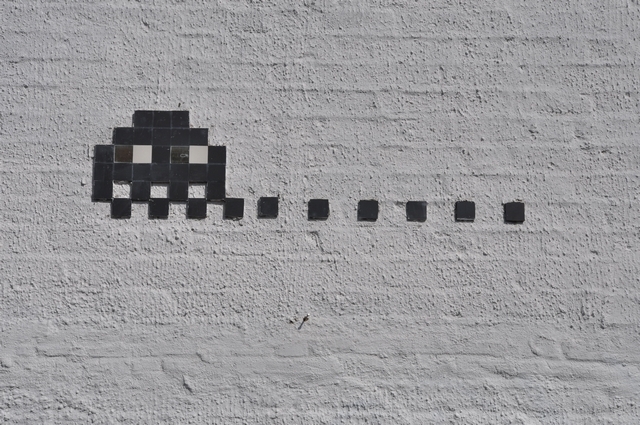 Invader so often invades virgin territory and when you are genuinely first to annex a particular spot for a piece of street art, its yours and you should go back and reclaim it when your piece is gone. If you look at all the "restoration" projects mentioned in this blog, that "my wall" status does seem to apply. For George - with thanks! 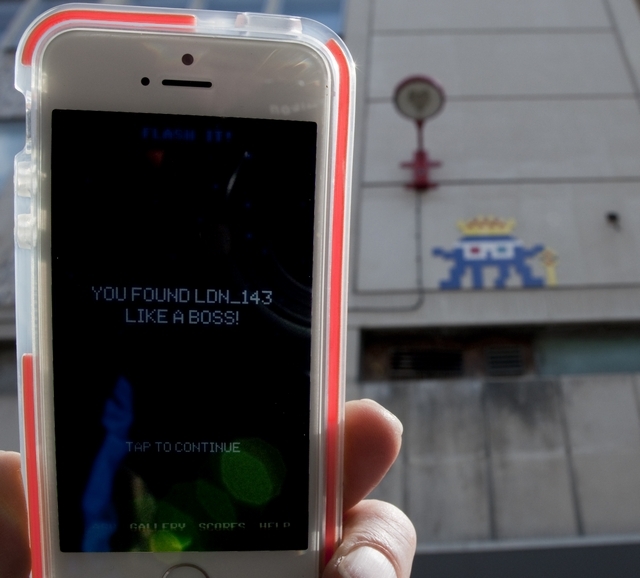 Borrowing an iPhone with a freshly downloaded Flash Invader app, I was able to throw myself into the geeky joy of “flashing” street Invaders for the first time. The UK isn't the only place benefiting from a Restoration Team, there is also one in France but keep those eyes peeled, who knows these may be part of an even larger invasion but we just don't know it yet. 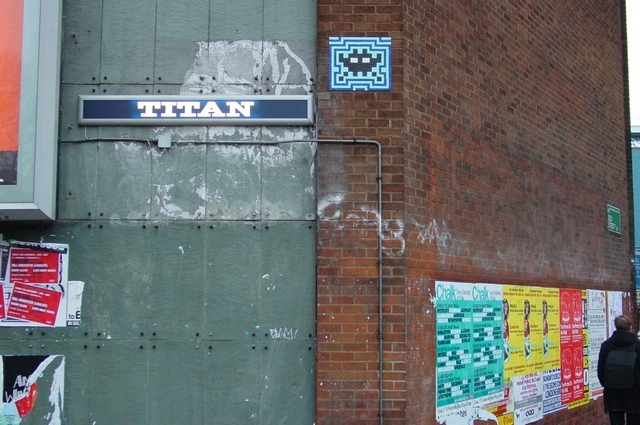 Two weeks ago I wrote the above Graffoto Post about Space Invaders being “reactivated” in London, I included images of 3 old lost and lamented Invaders I said I would love to see reactivated. 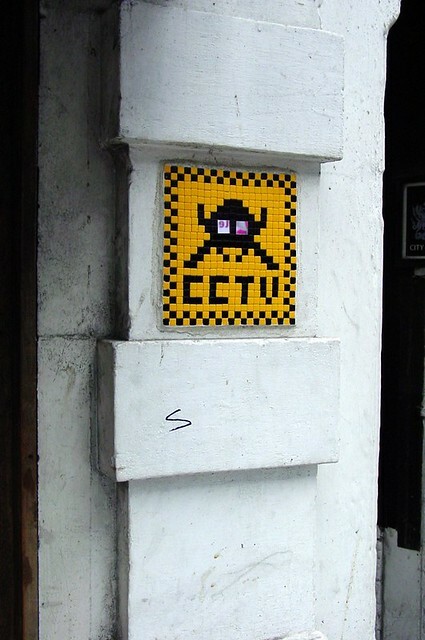 This morning, my wish was granted, the CCTV invader is back! I spoke to the man in the kiosk next to this Invader who said it wasn’t there last night and this morning it was there with some plain paper over it. 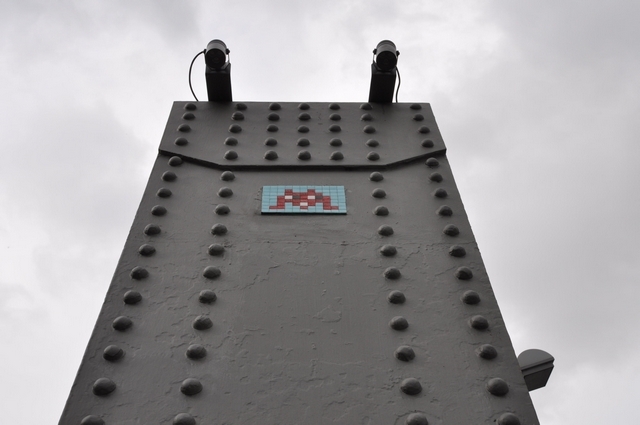 Ironically, I flashed it with the Invader app and got no points, “no invaders around here” it said, so too early for the app to have been updated. 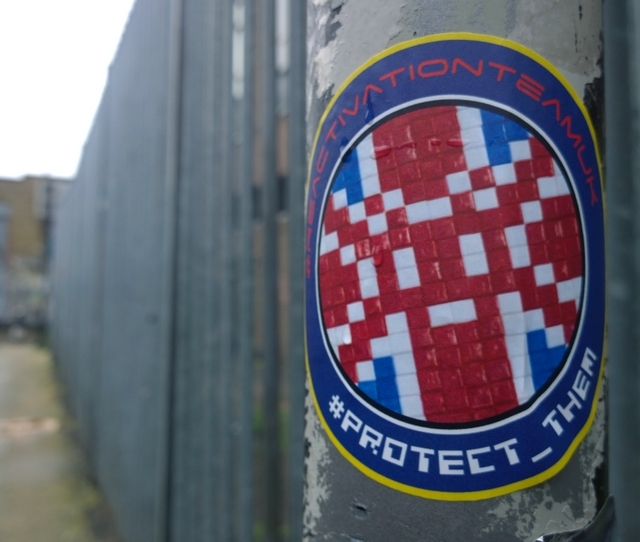 UPDATE 002 Earth Date Dec 2016: despite the presence of a reactivation sticker, the Union Flag Space Invader LDN_088 was not reactivated by the UK Reactivation Team. 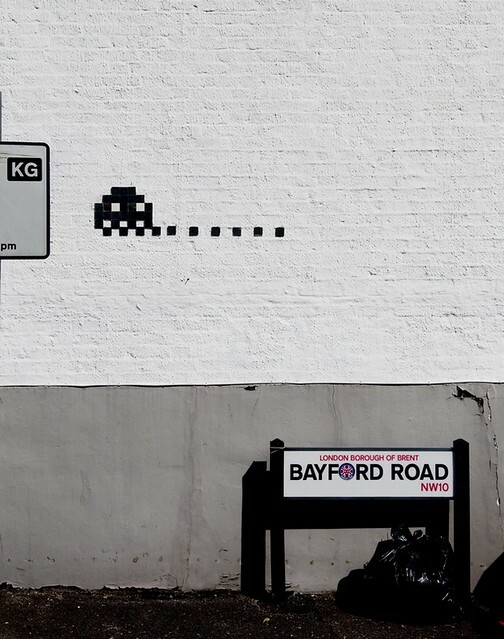 Nor was the large Invader LDN_027 on Bayfield Road, while LDN_028 was reactivated by a French team.